I finally got some decent pictures of my 510 up on Flickr. I'm pretty comfortable driving the car around, although not having a functioning alternator will make my commutes a little short until I get it replaced. Man, oh man. This is the year that my car will officially be on the road. Dude this is what I call passion, I really like your idea for a blog! !awesome, my second car out of high school was a 510 and I still woud have it, but my former STUPID landlord got it impounded and lost it! 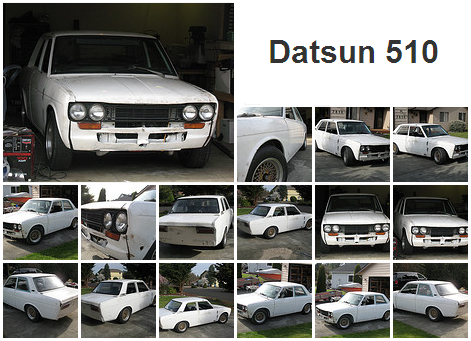 I hope to find one soon, in the meantime for my birthday 2 years ago I got as a gift an original owner '74 260 Z...I know I am probably wasting your time, but your blog got the best of me, I have always liked Datsun cars...your 510 looks great so far!